This week’s Food Share is another Pinterest favorite. This is one of my favorite breakfast “casseroles” ever. You can make it with pretty much any added ingredients you chose. Don’t like berries? Change the strawberries to peaches. Want to make it healthier? Don’t add chocolate. You get the idea. I always double this recipe and it lasts for most of the week. Preheat oven to 375 degrees. Spray the inside of a 9×13 baking dish (you can use smaller if you have one, but it should be bigger than 9×9) with Pam. In a large bowl mix oats, sugar, baking powder, salt, half the cashews, half the strawberries and half the chocolate. In another bowl, mix together milk, egg, vanilla and butter. 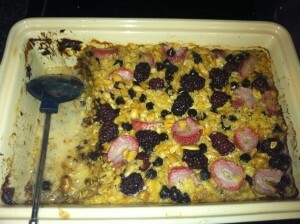 Add the oat mixture to the baking dish, then arrange the remaining strawberries, cashews and chocolate on top. Add banana slices and pour milk mixture on top. GENTLY shake the dish to help the milk mixture go through the oats. Bake 35-40 minutes until the top is golden brown. Serve warm.